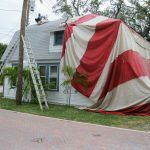 Bed Bugs - VERIKILL PEST CONTROL INC.
One of the last things anyone wants to hear from a pest control professional is they have bedbugs. The implications of a bedbug infestation are damaging economically and they may act as vector for disease transmission. One of the reasons California represents a large percentage of the billions of dollars in revenue the pest control industry generates is because of the climate in Southern California, is ideal for encouraging pest reproduction. Bedbugs are highly resistant to pesticides so an approach that takes into account their biology and resistance to conventional methods that cause mortality is necessary. We are among the best technical experts in Southern California in dealing with bedbugs. 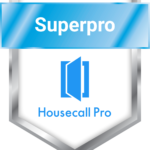 We can honestly say you could do no better than choosing us to mitigate this very serious problem. 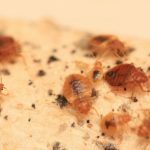 Bedbugs can live up to a year without feeding; therefore, the results of purely mechanical methods, such as exposure to temperatures above 120 degrees Fahrenheit, can be deceptive. Bedbugs are animals just like us and will run for cover when exposed to adverse environmental conditions. So methods like heat will often drive them into walls where they can become impossible to treat with any other method other than fumigation with a true gas like Vikane; a chemical commonly used to control termites. In other words tenting your home or business, a very expensive and inconvenient solution. A single female bedbug can lay up to 500 eggs and prefers to lay her eggs in temperatures just over 70 degrees Fahrenheit. She typically will not lay eggs in temperatures below 50 degrees, which explains why the majority of calls for treatment come during the hotter months of the year. Eggs are deposited in groups of around 50 and are covered by a sticky clear solution that stubbornly binds to fabrics, like the ones covering a mattress. In ideal conditions they will hatch in approximately 10 days, after which nymphs will immediately seek out their first blood meal. 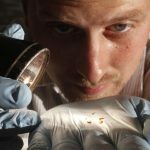 Until recently Bedbugs were not thought to be a vector for disease but recent research indicates that this is not the case. Bedbugs carry MRSA, a antibiotic resistant type of staph infection. Bedbug feeding behavior is analogous to how we use our television remote; we never want to be very far from the remote, likewise, bedbugs don’t like being far from their food source. So the places they will be found will have two conditions that are conducive to bedbug feeding, dark with a sleeping meal nearby. Usually bedbugs are found in your bedroom, underneath (because it’s dark) the corners of your box spring at the foot and head of your bed. Bedbugs are sensitive to light and the carbon dioxide we emit when we exhale. Bedbugs hide when the lights are on. When the lights go off it’s breathing that lets them know a meal is nearby and ready to eat. 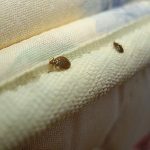 Bedbugs typically find their way into a home by hitching a ride on clothing after staying in a hotel room that is infested, being exposed to them in a home, riding in an Uber/Lyft, or picking up a piece of furniture left on the street. Say for instance you have a friend that likes to fall asleep watching television on their couch and because of this behavior bedbugs are living in and on the cushions. You go to visit your friend, watch a movie and then return home with a bedbug attached to your pant leg. This along with the possibility of your friends and family taking home your new problem are reason enough to attack this crisis sooner than later. It is important that bedbugs are handled professionally; dealing with this serious problem is not for amateurs; in many cases the problem can worsen if attempts to eliminate are made by those who are not pest control experts and have the supplemental training necessary to treat effectively. If you suspect you have bedbugs the best thing to do is nothing until positive identification is made and a treatment strategy is formulated by a qualified expert. We believe and most experts would agree that a chemical combined with mechanical solutions is the most effective remediation method. Treatment and then careful removal of items that are infested is the best approach. Clothing items are to be washed in hot water and then dried at high temperature or dry-cleaned. Fixing this problem is not cheap because it’s labor intensive and is about the most unpleasant work a pest control professional can perform. If you find yourself with this problem we advise you to fix it immediately because the longer one waits, the more costly it is to resolve because infestations become deeper over time. So don’t wait call VERIKILL 844-TOO-KILL today! This treatment is on a per room pricing system. Choose how many rooms you would like treated below.